Saudi Arabia has imposed a value-added tax, as one of the largest Gulf economies to boost non-oil income and narrow wide fiscal deficits caused by years of low oil prices. On Jan 1, 2018, the VAT came into implementation in the kingdom; the tax-free lifestyle has come to end. Value added tax, or VAT – 5 % plan – is applied on a various range of products, goods, and services like food, clothes, electronics and gasoline, as well as phone, water and electricity bills, and hotel reservations. Other Gulf countries are expected to implement their own VAT scheme in the coming years. VAT, as the name says, a tax amount added on the commodity to increase its value at each stage of its supply chain – production or distribution. It is charged and collected by the government from the businesses, who act as tax collectors of the government. The Government of the Kingdom of Saudi Arabia has published the Value-Added Tax (VAT) law on its official gazette “UM AL-QURA” on Friday 28th of July 2017. According to article 53, the law shall be effective from the beginning of the financial year that follows the publication of the law in the official gazette of the General Authority of Zakat and Tax (GAZT), more exactly by 1st January 2018. Also based on Article 53, all persons and businesses liable to register for VAT purposes, shall register with the General Authority of Zakat and Tax within 30 days from the date of publishing the law (i.e. 30 days from July 28, 2017). VAT is introduced across the KSA on 1st January, 2018. The Kingdom of Saudi Arabia and UAE will be the first 2 member countries of GCC to implement VAT. The other member countries such as Bahrain, Oman, Qatar and Kuwait are expected to implement VAT in the middle of 2018 or beginning of 2019. Only when ‘Executive Regulations’ for VAT are released, clarity on the conditions and controls for exempting the supplies mentioned in KSA VAT law will be available. How does VAT system work? VAT is known as a consumption tax, imposed on the consumption of product or service. Consumption tax is generally referred as an indirect tax and collected in the form of sales tax or VAT. Here in our case, VAT is imposed at every level of the supply chain where the value addition is performed to the product. The tax paid on the purchase of the inputs is “Input VAT” and “Output VAT” is that of when it’s collected during the sale. The Input VAT is adjusted to that of the Output VAT and the end consumer pays the entire tax on the purchase of the final product. In business credit-invoice method, the common form of the VAT, the business pays VAT on its purchase and collects VAT on its sales from another business or final consumer. Business credit for all VAT purchases is provided on all taxable goods & services (inputs to business). This business credit has the detailed invoices on the VAT paid by the business to its suppliers. All the business is subjected to submit their invoices to government revenue agency for the verification. Best Bicycles Ltd, bicycle manufacturer pays VAT 100 @ 10% on purchase of raw materials which are required to manufacture a bicycle. After manufacturing, he sells the bicycles to Top Distributors Ltd at 1,500 plus of 150. The VAT payable to the government by Best Bicycles Ltd would be the adjustment of input 100 with output VAT 150 and the balance 50 will be the payable. Top Distributor LTD sells the bicycles at 2,200 + VAT 220 to Favorite Bicycles Store who is a retailer. Since he has already paid VAT of 150 to Best Bicycles Ltd, he will allowed adjust Input put of 150 with output VAT 220 and the balance 70 will be payable to the government. Favorite Bicycles Store is retail store; he sells the bicycle to Mr. Imran who is end consumer for 2,500 with VAT 250. Similar to the above, Favorite Bicycle store adjusts the Input VAT of 220 with output tax 2500 and pays balance 30 to the Government. A-One Supplies 100 + Best Bicycles Ltd 50 + Top Distributor Ltd 70 + Favorite Bicycles Store 30 is 250 which is exactly the same amount of VAT paid by the Mr. Imran on purchasing the bicycle. Therefore, the businesses engaged in supply chain will pass on the burden of tax to next stage and ultimately, VAT is paid by the end consumer. Apart from the above, all registered businesses have to align their business reporting protocols in line with the consent requirements such as accurate and updated books of accounts, tax paid documents such as Tax invoice, credit notes, debit notes, records to all inward supplies and outward supplies etc. are required to be maintained. Who Should Register in VAT? Based on the annual aggregate, a business can be mandated to register or exempt from registration. VAT registration threshold is the deciding authority in determining the enrollment. All companies, whose business involves trading of taxable goods and services, and makes an annual aggregate more than SAR 1,000,000 is legally required to register for VAT by 20th December 2017. However, all taxable persons whose annual aggregate exceed the mandatory registration threshold of SAR 375,000 but do not exceed SAR 1,000,000 have been provided with time period until 20th December 2018 to register. Those which make an annual taxable supply of goods and services in excess of SAR 187,500 are eligible for voluntary Registration. Voluntary Registration provides significant benefits for the companies since it allows the deduction of input tax. GAZT may request documentation from the taxable person to evidence that the above requirements are met. How should you register for VAT? To register your business for VAT happens in two-step process. Before you proceed with online VAT registration, you have to create an e-Service account. The setting up of an online account is quite similar to setting up of other online accounts like Gmail, Yahoo etc. To create an account, you need to visit https://www.vat.gov.sa/en/vat-e-services/vat-registration and click ‘Register Now’ option available on the center of the screen. Click on Sign up and then click on the agree to the terms and conditions. In the sign-up form, please select if you are an existing user ( one with GAZT Tax account number TIN) or a new user( one without GAZT Tax account number TIN). You will receive an email at your registered email address asking you to verify your email address. On logging to your e-Service account, you will be able to see the option ‘Register for VAT ‘as shown below. You will receive a login code through SMS message for every login. This code needs to be validated everytime you wish to login to GAZT Portal. Please make sure you have valid email ID and mobile number to use the online services of this website. If you have not received a new password that means you should sign up again. To start the VAT Registration process, click on ‘Register for VAT’ available in your dashboard as shown in the above image. 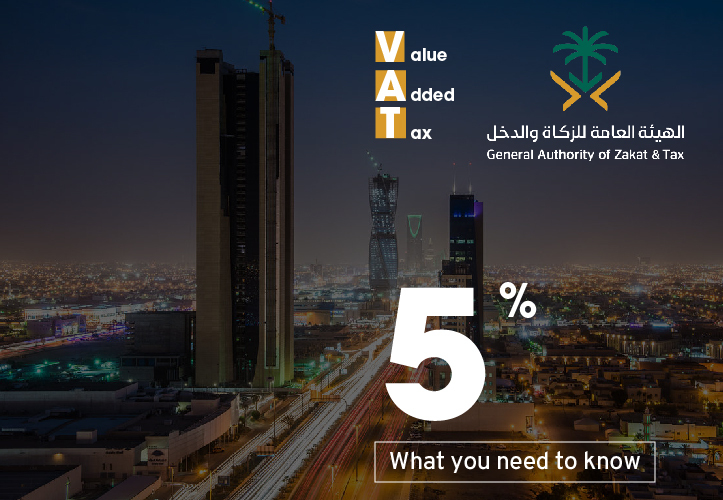 The Instructions tab helps you understand certain important aspects of VAT registration process in KSA. It also provides the details on the information required for completing the VAT registration form. After reading the details in different sections of the guide, you need to tick ‘I agree with these conditions and proceed further’ and click on ‘Step 2’ immediately below the former line. Under this section, you have to select the appropriate and the correct information that fits your business and you. The proper attachment files in respect to the given information is important and necessarily to be attached in their respective columns, and then move to the next section by clicking ‘Step 3’ at the end of the page. You have to select the correct option on the right side of the page depending on your income and financial outcomes every year. The questions are mostly regarding the taxable sales of your business annually. Pick the right option and also attach the statement file in the requested column. The above image is the ‘how-to’ to attach the files requested by GAZT. Under this section, you have to attach two files – custom reports and income statement. To move on to the next section, press on ‘Step 4’ button. This section is mandatory for the non-resident tax payers. If you are KSA resident taxpayer, you can skip the section by pressing on the ‘Skip’ button on the right side. To know about the non-residents VAT registration, click here. Download and save your acknowledgement form. A tax group is a group of two or more persons registered with the GAZAT as a single taxable person subject to fulfilment of conditions under KSA VAT Law. Group registration is the process by which 2 or more legal persons apply (grouped) together for the purposes of VAT treatment. The Group is treated as a single Taxable Person with consolidated Supplies and joint responsibility if the General Authority of Zakat and Tax (GAZT) approves the Group registration application.This group registration is only for the purpose of tax. Taxpayers may wish to register as a VAT Group, provided they meet all the following criteria. Each legal person is a resident in Saudi Arabia and carries out an economic activity: Every person of the group shall have a Place of Establishment or Fixed Establishment in the State. The relevant persons shall be Related Parties: Here related parties refers to two or more persons who are not separated on the economic, financial or regulatory level, where one can control others either by Law, or through the acquisition of shares or voting rights. One or more persons conducting business in a partnership shall control the others: This implies that one or more person who are related, controls the other business. For example, officers or directors of one another’s businesses, partners in each other’s business etc. A request to form a VAT Group should be made by one of the Group members – who is already registered for VAT individually. The Group representative will have the primary obligation to comply with the obligations and rights of the Group on behalf of all members, without prejudice to the joint liability of the remaining members of the Group. As part of the registration process, the representative will be required to provide supporting documentation to evidence that the eligibility criteria are met. Group registration is available on the GAZT e-portal . VAT Return, also known as ‘Tax return’ is a periodical statement which a registered person needs to submit to the authority. In essence, the taxpayer is collecting VAT on behalf of the General Authority of Zakat and Tax (GAZT) and has the right to claim back VAT paid on his taxable purchases. The details and data to be furnished in the VAT return for the purpose of tax are specified in the KSA VAT executive regulations. All the details as required in VAT Return, needs to be prepared in accordance with the VAT Return format issued by the authority. Taxable persons who make an annual taxable supply of goods and services in excess of SAR 40,000,000 are required to file VAT returns monthly. All other taxable persons are required to file VAT returns quarterly. However, such persons may choose to file monthly returns subject to approval by GAZT. The registered businesses in KSA are required to file online VAT return through GAZT e-portal. The VAT return form is expected to be at summary level. This means, the registered businesses are required to submit the consolidated details of supplies such as total sales, total purchases, output VAT, input VAT and tax payable. The VAT return filing is entirely online in KSA. This means, all the registered businesses are required to submit their VAT return statement by logging in on the GAZT portal. The portal is designed to accept the returns only through online mode. The offline capabilities to file VAT return through XML, EXCEL or any other utilities are currently not available. This implies that the taxpayer is required to manually provide the values of Sales, Purchase, Output VAT, Input VAT etc. in the appropriate boxes of VAT available in GAZT portal.